Pages and Posts | Making a Website with Thinkspace! 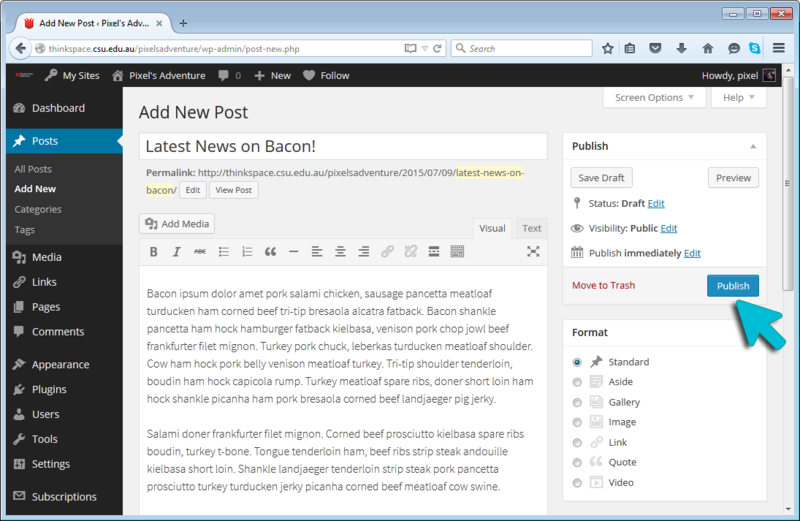 Posts: Posts are where you publish the latest update or new articles on your blog. Pages: Pages are used for information that you want to share with your readers but don’t expect to update frequently. When using Thinkspace to create a more traditional website, Pages become the most important element. However, posts can still be used as a way of posting quick updates or news. Pages on Thinkspace are normally used for information that you want to share with your readers but don’t expect to update frequently. Contact Page: So users can get in touch with you. Page Title: Tells the reader what the page is about. 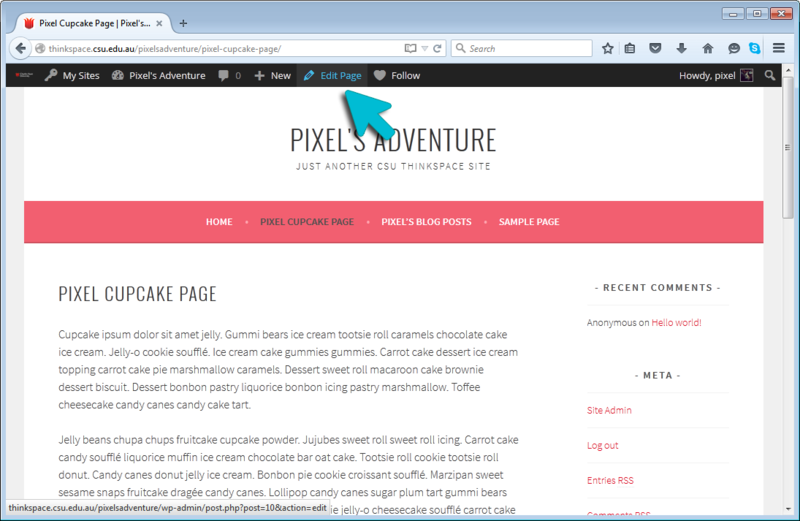 To create a new page rollover the ‘Pages’ Tab on the left hand menu and choose ‘Add New’. Give your page a title and add the content you wish to share on the page. Click on the ‘Publish’ button to complete the process. To locate page you would like to edit, simple navigate to it on your site and click the ‘Edit’ button in the Admin bar at the top of your screen. 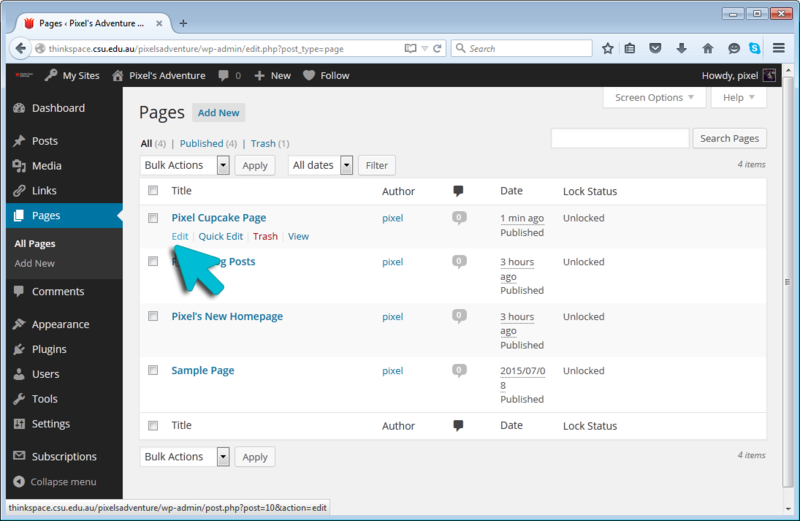 Alternatively you can locate a list of all the pages on your site via the ‘All Pages’ screen within your Dashboard. Make the changes required to your page using the Thinkspace editing tools and press the ‘Update’ button to publish your updated page. Thinkspace allows you to make pages Password Protected or Private. This can be useful if you are sharing resources or information that you would like only specific users to access. For example, the post might contain student work or photos that you only want to share with the family, students or other teachers. Step 1. 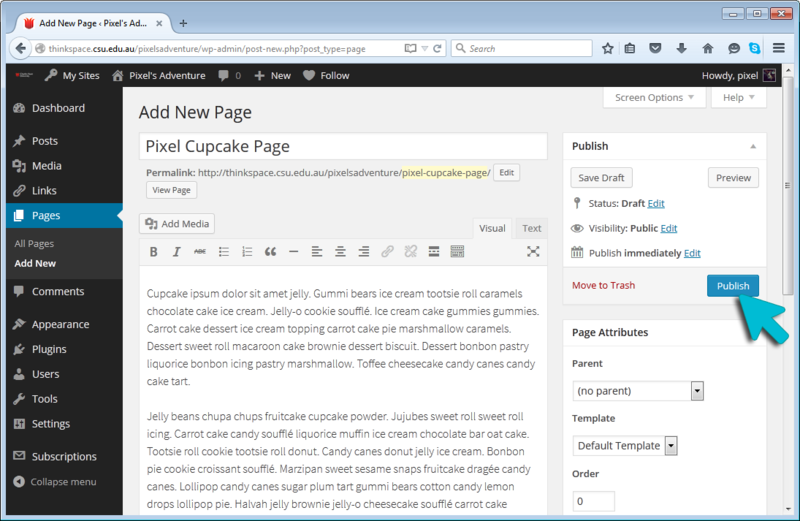 Click on ‘Edit’ in the Visibility area of the Publish module on the right hand side of the page. Step 2. Select the Password Protected option, enter your password and click ok. Step 3. Click on the ‘Update’ button to publish your changes. Your posts are where you’ll publish your blog posts or news items such as what’s been happening in class, assignment information, documents etc. They are commonly displayed in reverse-chronological order with the most recent post at the top of the page on your Blog Page. Post Title: Tells the reader what the post is about. A great post title grabs readers attention and is more likely to encourage them to read your post. Date published: All post display the date a post was published. You’ll normally see this displayed at the top of the post. Written by: Most themes display the name of the post author. Your username is automatically displayed unless you have changed your display name. Comments: All themes have a link to comments. This is where your readers can click to write a comment in response to your post. Comments allow students, and other readers, to engage in discussions, share their thoughts and connect with your class blog. Tags: Are used to help readers locate posts on your blog. Tags are more like the index at the back of the book and explode the topic into a million bits. Categories: Are used to help readers locate posts on your blog. Categories are often used like chapters of a book; they provide a general overview of the topics you blog about. To create a new post rollover the ‘Posts’ Button on the left hand menu and choose ‘Add New’. This will take you to the Post editing screen where you can add text, images and other media. When your post is ready for publication click on the ‘Publish’ button on the right hand side of the page.